Ask any collector what year the first Lincoln cent was minted, and they will tell you 1909. This falls under common knowledge. But this was not the first time a 19mm metal with Lincoln on the obverse circulated in the United States as 1/100th of a dollar. No, the first came in 1864, when Honest Abe was still alive. They are even listed in The Red Book! 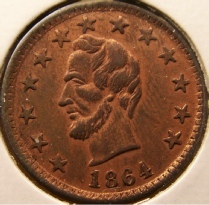 Not under “Lincoln Cents” but under “Civil War Tokens." While these are called “tokens” and many collectors in mainstream numismatics would not consider these “cents”, I think they could be called “Civil War cents”. I’ll explain. As you probably know the U.S. was engaged in the Civil War from 1861-1865. It became apparent that the war would not be short, and citizens were fearful. They began hoarding gold, then silver and even nickel Flying Eagle and Indian Head cents as the outcome of the war was unclear. Readers of this article can probably relate somewhat to this situation as our country is now in financial turmoil and citizens are fearful and they are hoarding money. Today if a person does not want to use cash, then he or she could use a credit card. But back in the 1860’s there were none, and people needed something to purchase food and supplies with. At first people used postage stamps. These soon became a sticky mess if they got wet. Holders for stamps were made privately, but these were too expensive for widespread use. The Government tried issuing postage currency, and fractional currency. This worked for making change of 5 cents or more. The problem was many items cost less than 5 cents. The Government left the solution to its citizens. Thus was born the Civil War token. There are thousands of designs on Civil War tokens. All were meant to make the receiver at ease with accepting them as change when making a purchase. And what better way to portray the honesty of the merchant, than a depiction of Honest Abe on the front of the token? There are 13 different dies using Lincoln in the patriotic series of Civil War tokens. These obverse dies were paired with many different reverse dies, in metals such as brass, copper, copper-nickel, German silver, lead, and others making a little over 200 different combinations with Lincoln on the obverse. In addition a collector could also seek errors on these tokens to add some more variety to their collection. A 1909-S V.D.B. cent may be termed “rare” by collectors because there were “only” 484,000 minted. Yet a “common” Civil War token is termed as “greater than 5,000 known”. There is only one Lincoln CWT (Fuld number 136/397a) this common! Most are rated 1 to 2,000 known. Think about it. What if there were a Lincoln cent minted between 1909 and 2009 with only 1 known, or even 2,000 known? These would be worth hundreds of thousands, if not millions. Not so with Lincoln Civil War tokens. In The Red Book, Lincoln Civil War tokens are listed (for the most common varieties) at $30 in VG, $50 in VF, $80 in AU and $175 in MS-63. A collector could expect to pay a little more from a specialist in this field. First up is my Fuld 127/248a. 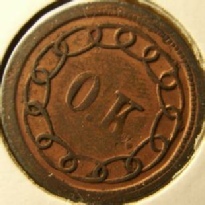 This is a copper token with Lincoln facing to the viewers left. It is rated R-4 which means 200 to 500 are known. The reverse says “O. K.”. I would guess that the maker of this token was saying “with Lincoln in charge, we will be O.K.”. Second is my Fuld 128/289b. This is a brass token with Lincoln facing to the viewers right. Rated R-3 (500 to 2,000 known). The reverse of this token is very interesting. It shows an eagle with the olive branch in its right talon and arrows in its left talon. This is symbolizing that we prefer peace over war. At the bottom are more olive branches again showing peace. 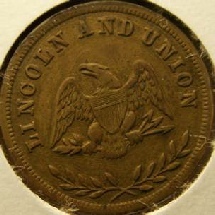 On the top curve of the token is the motto LINCOLN AND UNION. To refuse this token in change would be un-patriotic. This is my favorite of the two. 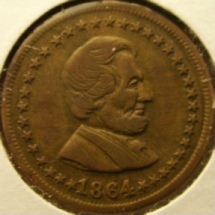 Civil War Token Society (founded in 1967) which you can do from their easy to use website using PayPal: www.cwtsociety.com. Membership is a very reasonable $15 per year. You will receive the Society’s excellent quarterly journal, which includes a mail bid auction in every issue. Once you’re a member you can receive discounts on back issues of the journal (a must for any CWT collector!) plus the Fuld books to look up the tokens in. Sources: The Civil War Token Collectors Guide, including complete Token Valuations for the year 2002 by Bryon Kanzinger, 2001, Valley Forge coins-books Division. Patriotic Civil War Tokens By George and Melvin Fuld. Fifth Revised Edition, 2005,The Civil War Token Society.